The restaurant is now owned by the Quave family. 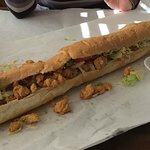 Since Quave is a Coast name we were expecting good poboys. (When we were there the old sign was still up so it’s hard to tell the restaurant changed ownership). My husband and I ordered oyster PoBoys and they were seriously the worst we’ve ever had. The oysters weren’t seasoned and they were soggy. Also the bread was chewy. Not a good Coast poboy by any stretch of the imagination. Only canned or bottled drinks and water was offered only in purchased bottles. We loved the restaurant under the old ownership but we won’t be back. OMG. Talk about a hidden gem. 1st off there's 2 poboy restaurants with Orleans in the name. This one is a must. A whole loaf poboy is the price of a large elsewhere and it's FILLED , I mean filled. The place is quaint, yet very clean. While eating the wall had a painting about their Pho. I got the house special to go and when I tell you fabulous!!!!! Even though it was a day in the fridge this was amazing. They even carefully wrapped the meat separately, it was soooo good nothing but high praises!!! New Orleans Style Seafood Poboys restaurant is a family affair. From VietNam to New Orleans and now to D'Iberville (Biloxi) in 1991, all the family has worked together (Katie, in charge when we were there, is the youngest of the daughters and says that's the best part of the business). We were there for take-out, but the open layout of the restaurant, as well as the attitude, is very child-friendly. Their name stress New Orleans Poboys, but equal emphasis (or a little more) is given to VietNamese cuisine. Emphasis is on the basics of pho, hu tiu-mi, and bun. The New Orleans side of the menu offers a variety of poboys in five sizes, plus platters of seafood or pasta. We wanted poboys (oyster, even though July doesn't have an R), and we were not disappointed. Prices were reasonable, also. Been to New Orleans Style Seafood? Share your experiences!